Tuesday the 22nd of January 2019, Aleia Roses received the MPS SQ (Socially Qualified) certificate of "Millieu Project Sierteelt" (MPS). Mr. Gerrit Jan Vreugdenhil, Commercial Director of MPS, handed the document over to María del Mar Parra, Agricultural Engineer at Aleia Roses. 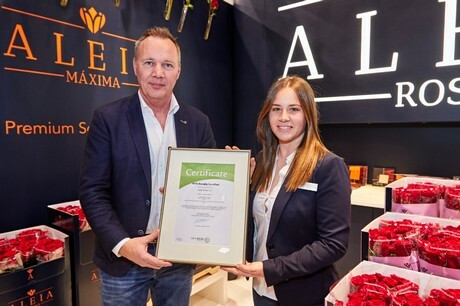 This festive event took place at the stand of Aleia Roses, participating at the International Pflanzen Messe (IPM) in Essen, Germany. The MPS SQ certificate indicates the social involvement of companies. Good working conditions are an important concern to many traders and consumers. The importance of good cultivation methods and information about the origin of products is increasing. On top of that the social aspects of a producer are gaining importance too. MPS SQ gives an answer to this demand by indicating that a company is meeting up to the current requirements. Like in the field of health and safety. The MPS-SQ certificate is based on universal human rights and the codes of conduct of representative local organisations. The agreements of the ILO (International Labour Organization) are also included. The Spanish grower of Red Naomi! strives to produce biologically, has an eye for the environment and is socially involved. Aleia Roses cooperates with ILUNION, a Spanish organization which helps people who suffer from eye diseases. Next to that, providing jobs helps to reduce depopulation of the province of Soria where depopulation is most in Spain. Aleia Roses is very happy to add this MPS SQ certificate to the range of documents it already has; MPS GAP and MPS A.